A spiral cut, honey crusted - glazed ham perfect for any holiday or special occasion. Today I'm posting a recipe for the tasty ham that we enjoyed over the Easter holiday. I meant to get this up yesterday, but ran out of time when we got back in town. This would have been perfect yesterday, because it was National Glazed Spiral Ham Day. I love Honey Baked Hams, but quite honestly, we just can't afford them. I tell myself every year that I will buy one until I see the price. I thought instead of purchasing one why not try and recreate one at home. I searched online, but there were a ton of recipes. I wasn't sure which recipe to go with, because I didn't know the ingredients that the honey baked ham company uses. I just kept going through recipes until I found a recipe that caught my eye. 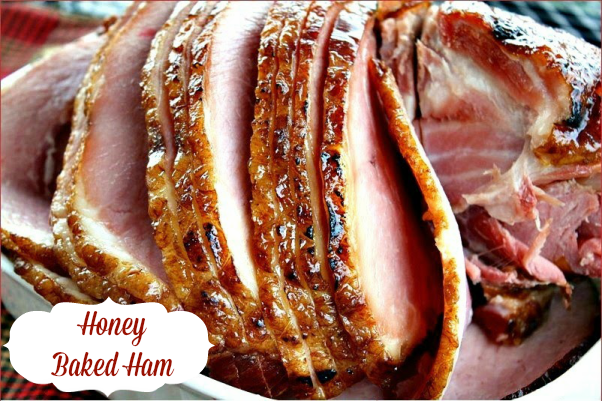 That's when I came across this recipe for a Copy-Cat Honey Baked Ham. I loved all the ingredients in this particular recipe, so that's the one I went with. It called for a spiral ham, honey, brown sugar, pear juice, orange juice and the use of butane torch. Oh, what fun what fun! I told myself all you can do is try it and see how it turns out. Since the ham was already fully cooked the whole recipe took just an hour and 15 minutes from start to finish. The directions were pretty straight forward, so this recipe is really easy to follow. I have to admit I had a lot of fun using the little butane torch to caramelize the glaze. The ham tasted wonderful and I loved the sweet-sticky glaze on top. 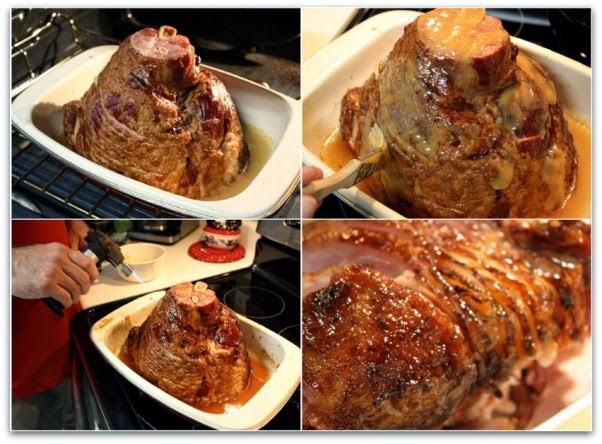 I'm sure this is not the how the real honey baked hams are made, but I can tell you this is my new go to ham recipe for the holidays, because everyone loved it!! Here are a few step by step photos of the whole process. Don't let the butane torch scare you off, because it was really simple to use. Preheat oven to 300°F. Place the ham, cut end down, into a large baking pan. Mix the pear or apple juice with the orange juice in a bowl and mix. Pour the juice mixture over the ham, cover with foil loosely and bake for 15 minutes per pound basting frequently with juices. Remove from oven. Mix brown sugar and honey together in a small bowl. Brush mixture over ham and bake uncovered for another hour or until internal temperature reads 145°F. Using a mini butane torch carefully caramelize the glaze to the crust using small strokes until very lightly crispy, sizzling and sticky. If you don't have a butane torch you can caramelize the ham by placing it under your ovens broil. Broil until the top is crispy, sizzling and sticky. Make sure to watch the ham closely. Cook's Note: Small culinary cooking torches can be purchased at Amazon, Walmart, Target, Home Depot or Lowes. This looks so good. We love ham and I enjoy trying different glazes, so I will have to try this one. Remember to cook down the bone after you make ham and spinach lasagna with the scraps and make baked beans for your hot dog nights this summer! I just made 7 containers from ham broth I had today. They freeze amazingly! Oh man I loved Honey Baked Ham!!! I can't wait to give this recipe a try during the holidays! I wanted to let you know I Featured you on my Favorites from last weeks Creative Thursday Link Party, so stop on by and check it out. And of course, please post some more yummy recipes. Have a great week. Looks so amazing! I am going to have to give this one a try. I am now following you on Facebook! Hi I am wondering if I can make this in the crockpot? If so would I just put all the ingredients in the slow cooker and cook on low until heated thru maybe 8 hours ?? Let me know I would love to try this on Sunday.. Hope to hear back from you by then thanks. I don't know if you have an Aldi store nearby or not. I usually buy the Aldi spiral ham and use their glaze (I don't have a butane torch). It's really delicious but the basting of yours sounds really good. I usually buy the farmland spiral hams. I throw away the packet that comes with it and use the recipe above. i have a question can i make this in a crock pot? This was very good, I added some cinnamon, ginger and pumpkin pie spice to the glaze as well, very good fall dinner! I use the packet that comes with the ham and mix half cup honey and half cup of brown sugar and 3 tbls of hot water. Mix and put that on the ham!! Family loves it!! this recipe is the best. I made my ham last year using this recipe minus the torch and turned out delicious. We love ham also but I was never to much on spiral hams they seem to dry out to fast, but this recipe I will definitely try! I was personal friends with a family that owned a honey baked ham franchise. This family also owned a Long John Silvers Franchise. During the Christmas Season, ordered 50+ 5 pound honey baked Hams for all of upper management. I was told the butane torch was very important to the crispy taste of the honey baked ham. Can't wait to try it. Best Wishes and Happy Holidays to.y'all. We used a Meijer spiral ham last year. It was very good and moist.. I would love to try this but I need to use an 8-9 pound ham. Anyone know how long it should be cooked? Thanks! It is just an educated guess, but I would not cook this type of ham in a crock pot. I THINK it may end up with a sort of stewed taste or like ham that cam from a soup. I would save the crock pot method for making left over soup. Just a guess. Good luck. Sounds VERY good! Where does one look for a butane torch? Looks like a bone-in ham, not a boneless one. I recently prepared a bone-in ham using Jacques Pepin's maple syrup glaze recipe, my family said it was the best ham I had ever served. It isn't stated anywhere that it was a boneless ham. Not sure where you read that. I only use bone in ham for soup and beans with the leftovers. I made this for Christmas dinner yesterday and it turned out great! My husband had a torch that's for soldering metal and it worked just fine for the ham too. I was a bit timid with it and I think the ham would have been even better if I had torched it a bit more. I'll be making this again though, because the whole family loved it! I'm looking forward to trying to make this for Easter. My question though is on the glaze. Since you are baking it in the oven with the spiral slicing facing down, do you torch the bottom of the ham first and then plate it and the torch the spiral sliced side? Please advise. Thanks. You are just caramelizing the outside of the ham. You say to put the cut side down. Does this mean the side that has the slices should be placed face down? Not sure how the glaze would get on the top of the slices. Sounds delicious. The ham is placed cut side down like in the photo directions. The glaze goes on the outside which is also where the slices are. The glaze does not go inside the slices but more on the outside of the ham. How do you keep the spriral ham from drying out while baking and the edges from curling up?